Patrick Burns is returning with a revamped Sunday Politics show this weekend. Patrick Burns is returning with a revamped Sunday Politics show this weekend. Graham Young reports. 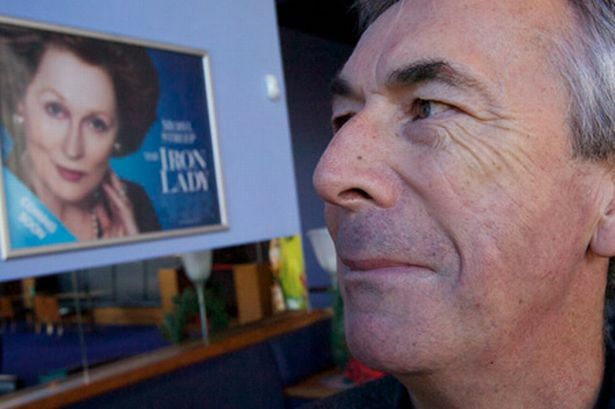 Midlands Today’s political editor Patrick Burns interviewed Margaret Thatcher six times during her 11½ years in office. Two decades after she left Downing Street, he’s just been face to face with her again. Only this time it’s been at Cineworld Broad Street, watching the 16-times Oscar-nominated actress Meryl Streep playing The Iron Lady. Even if he acknowledges the film could have dealt with so many issues in a different or more expansive way, 59-year-old Patrick is still wowed by what he’s just seen. “It’s an amazingly convincing performance by Meryl Streep,” says Patrick as we leave the screen. “If cinema is about the suspension of belief, I certainly suspended mine. “I could certainly identify with the person I met and saw in the House of Commons, a woman who was idolised by some and demonised by others. “She had a certainty that she would not be thanked by what she did at the time. “I would have liked to have seen more arguments about the events like the sinking of the General Belgrano. “And I would have liked them to explore the myth and and the ideology/demonology a bit more. Patrick first studied Mrs Thatcher during her party leadership contest with Ted Heath – it was part of the exercises for trying to get a job with the BBC. “She meant what she said and I remember she insisted on getting out and meeting people,” says Patrick, who will return to our screens this weekend when Sunday Politics is launched as a revamped version of The Politics Show. Like John Craven of Newsround and Countryfile fame, Patrick is a trusted pair of hands, a useful trait when your modus operandi is to deal with lesser spotted politicians from all political spheres. Especially in the recent era of the expenses scandal. A Warwickshire cricket and Birmingham City football fan from Erdington, Patrick nominates fellow Bluenose Malcolm Stent as his favourite Midlands comedian, a man who would certainly smile at the following story. A staunch supporter of the CBS0 (which Patrick believes is now even eclipsing the Rattle years), he was with people who had spilled out on to the main concourse during a Symphony Hall show interval. With public access having been a condition of the ICC’s build, Patrick was left much more surprised by the instant reaction of a Rastafarian gentleman in full garb than the fact he was walking through. Patrick will remember those direct words when he goes into battle live on air this weekend as one of Sunday Politics’ 15 regional correspondents. “This man shows that we’re reaching out beyond the clichéd view of who people think are watching,” says Patrick. “The BBC has a special relationship (with viewers). Patrick, 59, must have a unique place in any television office. When he’s sitting at his desk he can see everything that’s going on in front of him at the BBC’s Mailbox studios. If he swivels around and walks half a dozen paces, he’s standing on his own newly-remodelled studio set. To his right, a Guardian wallchart shows just how few Prime Ministers this country has had down the decades. The strip of lights above are an elongated reminder of his early teenage years. “I achieved great height very early on,” he smiles regarding his 6ft 3in frame. After moving from King Edward VI Aston School to the University of Manchester, playing cricket gave the politics and modern history student a new perspective. “The height became an advantage for a menacing fast bowler,” chortles the man whose other skill is ‘to play honky-tonk piano very, very badly’. More seriously, his place on the BBC’s graduate training course from 1975 led to several years in Northern Ireland covering the Troubles. Then, when Brian Hanrahan and co were shipped off to cover the Falklands War, he was asked to work as a political correspondent in London alongside the great John Cole. This period rekindled his natural interest in Westminster, which had been fired in 1975 when given the privilege of seeing Harold Wilson addressing the House in ‘a fantastic moment of theatre that was an echo of another age in politics’. Since meeting Margaret Thatcher in Northern Ireland, Patrick has interviewed every Prime Minister since – so that’s John Major, Tony Blair, Gordon Brown and David Cameron. What is it like to interview a PM? “You’ve got to be on your mettle,” says Patrick, his eyes reappearing. The biggest enemy is not the potentially double-handedness of an interviewee, but the clock. “I have a fairly high embarrassment threshold but you need a way of asking questions courteously,” says Patrick. “A bit like Just a Minute, politicians know the clock can carry us through and that’s the nub of the issue because you might have two or three more subjects to get in before it’s over. “I think (MPs) realise the audience has got wise to them and is intelligent enough to work things out for themselves. Patrick admits that, having been in the Westminster lobby since 1985, he does like politicians, generally speaking. “We’re actually quite lucky in this country that for all of the scandals, I don’t think most of the politicians deserve the pariah status of us journalists, estate agents and bankers. Patrick always remembers some key words of wisdom from a late Radio 4 Today presenter from Wolverhampton. “Peter Hobday taught me that ‘If you’re not going to enjoy (broadcasting), then nobody else will’. “However difficult the news, you’ve got to maintain the fact that we’re the friend of the viewer; it’s not an ordeal otherwise nobody will watch and we would not deserve anybody to.” The two Prime Ministers who impressed him the most were Mrs Thatcher and Tony Blair. “They were great forces of personality and a considerable presence,” he says. What no politician can prepare for are those golden media clips so typified by Gordon Brown being overheard calling 65-year-old Rochdale voter Gillian Duffy a ‘‘bigoted woman’’. While no presenter can dream of being able to engineer headlines likes these, they suggest you can adopt a different approach to get results. Patrick will make two ‘‘packaged’’ filmed reports lasting four or five minutes each for Sunday Politics. There will be short references to the ‘‘stories of the week’’ and a pair of guests to interview all of which, he hopes, will help to make the programme ‘‘much more conversational’’. After the dominance of the Blair years, the arrival of a coalition government has certainly stirred up Westminster. “Everyone has an opinion now,” says Patrick, married for more than 30 years to wife Pauline who worked for Radio 4 news until their now two grown-up children were born. Excited that former Sunday Times editor Andrew Neil will host the main part of the programme from London, Patrick adds that ‘‘he is proven box office, so I hope it will be a fairly lively and opinionated hour’’. But wouldn’t the world be a better place if everyone just spent more quality time at home with their folks every Sunday? Patrick looks alarmed. More than two decades after the 16-year run of Weekend World ended in 1988, he argues that a Sunday lunchtime political programme still has an important part to play, by putting one week to bed and setting the agenda for the next on key issues like employment, education, transport, housing and the economy. In his own Midlands patch, stretching north to south from Stoke to Cheltenham, he points out that half a million people on a good day will be keen to learn more about regional politics at this time. “There’s an element of stocktaking about a programme like Sunday Politics,” reasons Patrick. “This is where we are. This is where we have been and where we are going. “The Politics Show has already run for nine series and the format has had a few modest relaunches in ten years. “I welcome the latest one. In fact, I’m very enthusiastic about it. It’s a shot in the arm. * Sunday Politics is on at noon on BBC1.